Most popular video formats including RMBV, FLV, AVI, VOB and etc can't be freely played on iPhone because of Apple's specification. Now you can use mediAvatar iPhone Movie Converter for Mac to convert most of popular video formats to iPhone MPEG-4 or H.264 videos. Only take few minutes and release your iPhone free with all videos. You can extract music from videos and convert other audio formats to iPhone music as well. Moreover, you can trim the input videos/music, customize video/audio settings, preview the videos with the built-in media player and take snapshot of the video screens. For your convenience, thie iPhone movie converter mac helps you directly export the outputted files to all iPhone models including iPhone 4. Free download mediAvatar iPhone Movie Converter for Mac. Convert your media files to iPhone videos and watch them on the go! Freely convert AVI, MPEG, WMV, DivX, MOV, RM, VOB and virtually all general or HD videos to iPhone MP4 videos. Convert WMA, MP2, OGG, RA, AC3, APE, CDA and other audio formats to iPhone music (MP3, M4A, WAV); extract background music from video files and convert to iPhone music. This iPhone movie converter for Mac allows you to convert lots of files at the same time, and also convert a single file to several iPhone video/music formats simultaneously. Introducing acceleration technology, this Mac iPhone movie converter converts videos to iPhone on Mac at the highest speed possible by detecting your computer configuration. All popular video and audio formats can be converted to your iPhone videos or music with mediAvatar iPhone Movie Converter for Mac. Input formats include AVI, MPEG, WMV, MP4, FLV, MKV, H.264/MPEG-4, DivX, XviD, MOV, M4V, VOB, ASF, 3GP, 3G2, SWF, H.261, H.264, DV, DIF, MJPG, MJPEG, DVR-MS, NUT, QT, YUV, DAT, MPV, NSV AVCHD Video (*.mts, *.m2ts), H.264/MPEG-4 AVC (*.mp4), MPEG2 HD Video (*.mpg; *.mpeg), MPEG-4 TS HD Video (*.ts), MPEG-2 TS HD Video (*.ts), Quick Time HD Video (*.mov), WMV HD Video (*.xwmv), Audio-Video Interleaved HD Video (*.avi), MP3, WMA, AAC, WAV, CDA, OGG, FLAC, APE, CUE, M4A, RA, RAM, AC3, MP2, AIFF, AU, MPA, SUN AU, etc.. This iPhone movie converter Mac makes it available for iPhone Mac users to convert one video file to both iPhone video and music formats at the same time. Allows you to specify the video clip start time and duration to extract a clip to convert to iPhone video. Change the output file quality and effect by specifying the parameters in general and advanced setting panels; a large range of expert settings are especially directed to more advanced requirements when converting video to iPhone on Mac. From terse interface to batch conversion support, this Mac video to iPhone converter makes it highly simple and quick to convert multiple files to iPhone videos and audios. 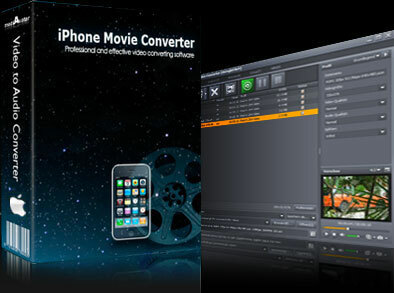 mediAvatar iPhone Movie Converter for Mac prepares iPhone video formats with different quality or parameters for your iPhone to suit your need most. mediAvatar iPhone Movie Converter for Mac have built-in resizable player which allows you preview loaded videos and take snapshots of your favorite pictures during preview. Available in 5 language interfaces: English, German, French, Italian and Spanish.